I have absurdist preferences in humor, so for me, literally the first twenty or so frames were the best part of this new short series. I was laughing out loud. But most of the show seems to kow-tow to the standard established by shows like Lucky Star, YuruYuri, and Joshiraku, insomuch as most of the program revolves around listening to the random conversations of several moe-rendered girls. This may be the preference for some viewers; it's not mine. That said, this show has one major advantage over those previous programs for the more plot-oriented among us; it's crazy short. Conversations can't really get too bogged down because, well, they can't feasibly last over three minutes anyway. It helps that the conversations are themselves pretty chuckle-worthy. I'm hoping, in the future, the show relies more on its flashes of absurdism than the conversational humor that follows in the wake of many other programs. That said, even as a show that's essentially about cute girls talking random stuff, it's a relatively funny one, and probably worth most people's time, given its tiny little airtime. I've watched a lot of anime but none have made me laugh as hard as this one. It's short but the episodes will leave you confused and hysterical. I highly recommend you give this anime a try. It's worth it. This is pretty terrible. It has some of the worst animation I have ever seen in my entire, life, the sense of humor is totally jacked up, and the characters are completely unlikable. Its humor reminds me a bit of American cartoons like Family Guy or South Park, but terrible. If you want crude humor go watch one of those, they at least can make you laugh. This is just... Awful... The only reason I gave it 2 stars is that it has a decent ED and it shows you how an anime should not be made. There's really not much worth seeing here. The so-called jokes just aren't funny, and there wasn't really anything intriguing enough to warrant watching more than a couple episodes. 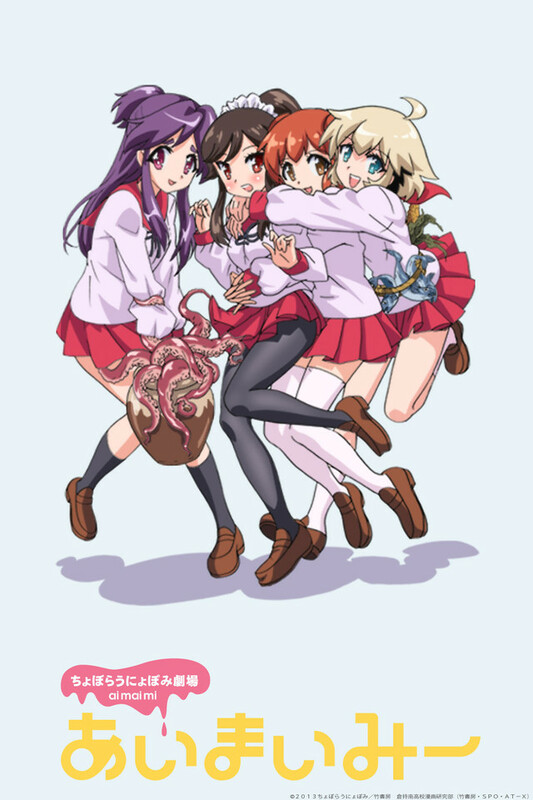 If you are interested in the premise, girls making manga, you'd be better off watching Mangirl. It's a decent show, unlike this. If there's one thing that this show has going for it, it's the premise. I always found the concept of girls making manga pretty cute and ever since it's announcement I've been looking forward to seeing because, hey why not? The character design is pretty cute. No doubt the expectation of many is that it would be a cute and funny anime. However, nothing could be further from the truth. To be fair, there's no real plot to speak of. It's a "gag-a-day" format, popularized by shows such as Azumanga Daioh, Lucky Star and Nichijou. The premise is similar to that of Mangirl. A bunch of girls in a manga club. Pretty straightforward stuff, and I don't think any more needs to be said. I think this is where Ai Mai Mi falls the shortest. One of my biggest complaints about this anime is it's brevity. At 5 minutes long, it's painfully short and the writers have to come up with skits that will sure to leave the greatest impact within that short times span. The question is, are they able to pull it off? Answer: no. In the first five episodes that I've seen the jokes totally flew over my head. They turned out to be more confusing than humorous. I get that the writers want to make the stories unique and wacky, but it's just too "out there" for the average viewer to really appreciate. Hell, I would have been happier with simple, even cliched jokes. At least those would have been funny. If you're looking for random humor involving high-school girls, there are much, much better anime. Ai Mai Mi is good for a few chuckles, but that's it. You'd be surprised that the animation quality isn't bad at all. On that note, it's not great either. However to be fair, it does fit well with the wacky tone of the show. It's fairly smooth and you can't argue with how bright and colorful everything is. It goes a step to set the mood of the anime... not like it was particularly good to begin with, but it can't really be helped. This anime is a good case of "Good animations, bad writing." It's about four girls in a manga club. That's it? Pretty much. As expected from a series like this, the characters don't really have much of a back story. The main focus really is the antic they get into on a day to day basis. As I mentioned before, the humors is mostly hit and miss (mostly miss). On a plus side, their quirky personalities are amusing and it's interesting to see what kind of madness they get up to. That being said, they have the potential to be pretty funny but the sub-par writing and humor really is a stumbling block. Ai Mai Mi tries to be funny. Sometimes it is, most of the time isn't. The short running time really is what set the whole anime back and maybe if it was a regular 22 minute anime, it would fair better. Obviously the writers needed to shoehorn humor into 5 minutes and the end result was, to put it nicely, unsatisfactory. The show has a good premise, good animation, and cute characters, but there wasn't enough 'content' to really make me enjoy it. The bottom line is this: if you're looking for a few quick laughs, easily amused or fond of extremely random humor, this show MIGHT be for you. If you're looking for a funny, cute anime with lots of laughs, look elsewhere. Ai Mai Mi tries to deliver the feel of a gag-a-day comic strip but fails to deliver. I'm not surprised some didn't care for this show. However, those of us with bent brains quickly became addicted to the bizarre humor and sheer randomness of each episode. If you're looking for an anime that's about the average school life, standard storytelling, and sane characters, then this show is NOT for you. But like the artist's descriptions at the beginning of each episode, this show takes insanity to a new level. Personally I've found more entertainment in each 3-4 minute show than in most 30 minute shows. Twisted, random and hilarious. Thank you Choboraunyopomi. for such a wonderfully bizarre take on the anime world! If you were looking for an anime with an actual plot, you kinda came to the wrong place. This anime is so. . . weird, nonsensical and just plain crazy! But, I have to say, that's were it's charm is. I don't think I've had as much fun watching anything for a while, so it was nice for this breath of fresh air. The art is good to look at, and even at 3 minute episodes, there is enough here to keep you laughing for a while. The jokes can sometimes be a little to random, if you ask me, but the ones that I understood had me floored. If your in the mood for something crazy, or just want something to watch in between different series, this is the show for you. I fiercely reccomend at least giving it a shot! Extremely random...In the good way! All of the characters are killed and eaten by a Godzilla-like creature, blood included. I don't even know where to start, so I won't. Just watch it. It'll only take about 40 minutes to finish the entire thing. If you're not busy, you don't have anything to lose anyway right? Who knows, you might even learn something. Just kidding. You really won't. Watch it anyway.